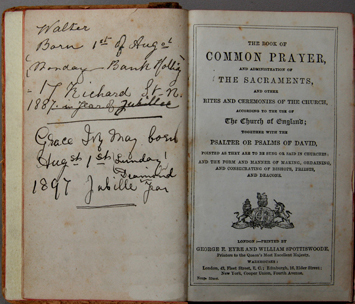 The above illustrations are from The Book of Common Prayer given to Alice Eliza Bristow on her 21st birthday from her sister Nellie in 1876. 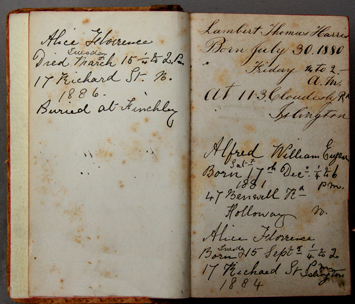 When Alice married Lambert William Harris in 1879 this book was used to record the births of all their children. Recorded in chronological order are Lambert Thomas Harris, Alfred William Eugene, Alice Florence, Walter, and Grace Ivy May Harris. 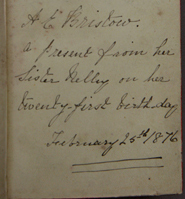 Also the death of Alice is recorded. Note that times, dates and addressess are given for each child. The house number of Benwell Road Holloway is wrongly shown as 47 instead of 57.